Saturday Night Live is back! Guess when it’s on! Here’s what’s up in the world of TV for Friday, October 2 & Saturday, October 3. All times are Eastern. Saturday Night Live (NBC: 11:30 p.m., Saturday): Live, from New York, it’s season 41 of Saturday Night Live. 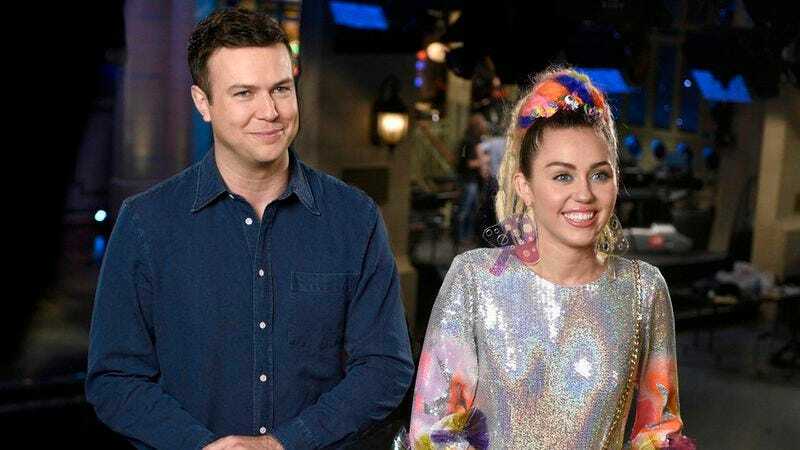 It appears not much has changed over at 30 Rock— Jost and Che behind the Update desk, all last year’s cast members (even those now moonlighting as supernatural exterminators) in place, and now three-time host Miley Cyrus is kicking things off, giving Vanessa Bayer a boost right out of the gate. Sure, there’s one new cast member (who will carry the “featured player” tag, at least until he proves that his decent Matthew McConaughey impression will eclipse the Trevor Noah-esque Twitter stain people uncovered once he was hired), but it’s still Lorne Michaels’ world. We’re just watching it. (And, speaking of “live from New York!”, why not tune up for the season by tuning in to the SNL documentary Live From New York! at 8 p.m.) Dennis Perkins has socked in all the coffee for his weekly SNL reviews. Sorry about the coffee—Dennis has all the coffee now. Dr. Ken (ABC, 8:31 p.m., Friday): Renowned scene-stealer and real-life M.D. Ken Jeong gets a chance to anchor his own sitcom, playing a doctor trying to balance his family life, medical practice, and a propensity for being far too honest with his patients. Can the Chang magic sustain itself over the course of an entire series—as a sitcom leading man, even? In the Fall TV Preview, Erik Adams had…issues. Blunt Talk (Starz, 9 p.m., Saturday): When Walter heads out to help Rosalie track down her missing husband, Jim has to take over for Walter. Brandon Nowalk fully expects Jim to immediately go bald and start firing photon torpedoes, but that’s him. Survivor’s Remorse (Starz, 9:30 p.m., Saturday): Everyone knows being a professional athlete is the key to big bucks, fame, and a comfortable life for you family—unless you get hurt. Tonight, NBA phenom Cam gets hurt. Joshua Alston’s holding his breath, along with the rest of Cam’s family. Anjelah Johnson: Not Fancy (Netflix, 3:01 a.m., Friday): The press release for this standup special from standup Johnson asserts, “Johnson has the audience rolling from her hilarious impressions of European Gypsies, Vietnamese manicurists, and breakdown of cholo church vs. regular church.” So, you know, see if that grabs you. It sort of did grab Kayla Kumari Upadhyahya, who gives it a solid B and is very smart about such things. The Amazing Race (CBS, 8 p.m., Friday): Buenos Aires hosts an episode entitled “Get In There And Think Like A Dog.” That sounds like the setup for a really clever joke, but damned if we can see it. Last Man Standing (ABC, 8 p.m., Friday): Tim Allen continues to assert that men are a certain way while women are a very different way. Hawaii Five-O (CBS, 9 p.m., Friday): The bomb squad is attacked—with bombs! How did they not see that coming? Ai Weiwei: The Fake Case (PBS, 10 p.m., Friday): From the POV documentary series comes this portrait of impish artist Ai Weiwei, who couldn’t help razzing the Chinese government, even after they jailed him for criticizing the Chinese government. Those are some big, artsy balls, right there. The Jacksons: Next Generation (Lifetime, 10 p.m., Friday): Various Jackson family children decide to follow in their famous musical family’s footsteps. What could possibly go wrong there? Blue Bloods (CBS, 10 p.m., Friday): Tom Selleck’s manly loins spawn nothing but cops. This week, several of his brood chase a serial killer. Another thinks about becoming a judge. Meanwhile Selleck just sits back in his leather chair, smokes a cigar, and ruminates on whether he’s bred sufficiently to eliminate all crime. Strike Back (Cinemax, 10 p.m., Friday): Scott and Stonebridge bash their way over to Switzerland in search of that nuclear bomb they lost. It’s okay, though—they managed to squeeze a pair of wire-snippers in their bandoliers. Plus, they’re pretty sure it’s always the blue wire. It’s almost usually the blue one. Z Nation (Syfy, 10 p.m., Friday): Again, for those out there who like their zombies a little more—shall we say—loopy than those grim Walking Dead/Fear The Walking Dead curmudgeons, tonight’s Z Nation sees the survivors seeking to treat zombieism with a natural cure from a greenhouse guarded by zombie-plant hybrids! That is not a typo, not have we here at What’s On Tonight central just started making listings up. Zombie. Plant. Hybrids. Continuum (Syfy, 11 p.m., Friday):Kiera’s mad that Brad seems to like the soldiers from the future more than her. To be fair to Brad—they probably have access to jetpacks. SXSW Comedy Night Two With W. Kamau Bell (Showtime, 11 p.m., Friday): Since Totally Biased was totally cancelled, W. Kamau Bell’s been busy being hilarious and smart in other places, including hosting this series of standup specials from SXSW. On this second outing, he welcomes the likes of Wyatt Cenac, Todd Glass, and Rachel Feinstein, none of whom will presumably be cancelled in the middle of a totally funny set. Black Jesus (Adult Swim, 11 p.m., Friday): Someone thinks Black Jesus and his disciples are terrorists. Chill, weed-smoking terrorists preaching nonviolence. Night Of The Wild (Syfy, 9 p.m., Saturday): Your dogs are coming to kill you! Rob Morrow says so in this Syfy original movie about a meteor crash that sends a small town’s entire canine population on a kill-crazy rampage. If you’re missing Zoo, Rob Morrow’s got just the movie for you! Autumn Dreams (Hallmark, 9 p.m., Saturday): At their 15th high school reunion, former sweethearts discover the annulment of their quickie marriage was never finalized. Should they get back together, since they’re married and stuff? Well, teenagers do seem to make great romantic decisions. Guardians Of The Galaxy (Disney XD, 9:30 p.m., Saturday): He is still—we have it on good authority—Groot. Review: Emily L. Stephens looked into the abyss that is Forrest MacNeil’s commitment to the reality show/Biblical tragedy that is Review and gave it an A. Sure, her hair turned white, but an A’s an A.